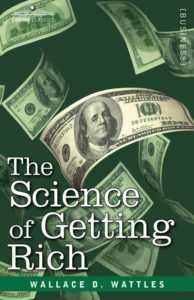 In my series of videos on The Science of Getting Rich, Wallace D. Wattles’ pioneering work on using the power of your mind, I’ve covered his steps to creating your success. Now, in Part 8, it comes together as we learn about receiving riches. Wallace says there is a thinking stuff from which all things are made. In its original state, it permeates, penetrates, and fills the interspaces of the universe. A thought in this substance produces the thing that is imaged by the thought. Wallace says we can form things in our thoughts. Then, by impressing our thought upon what he calls the formless substance, we can cause the thing we think about to be created. In order to create, we must pass from the competitive to the creative mind. Otherwise, we cannot be in harmony with the formless intelligence which is always creative and never competitive in spirit. We may come into full harmony with the formless substance by entertaining a lively and sincere gratitude for the blessings it bestows upon us. Gratitude unifies the mind of man with the intelligence of substance, so that man’s thoughts are received by the formless. We can remain upon the creative plane only by uniting ourselves with the formless intelligence through a deep and continuous feeling of gratitude. We must form a clear and definite mental image of the things we wish to have, to do, or to become; and we must hold this mental image in our thought, while being deeply grateful to the supreme that all his desires are granted to him. The man who wishes to get rich must spend his leisure hours in contemplating his vision. Too much stress is laid on the importance of frequent contemplation of the mental image, coupled with the unwavering faith and devout gratitude. This is the process by which the impression is given to the formless substance and the creative forces set in motion. All that is included in this mental image will surely be brought to the person who follows the instructions given and whose faith does not waver. In order to receive,you must be active. You must keep in mind the purpose to get rich through the realization of your mental image. Every day you must do all that can be done that day. Take care to do each act in a successful manner. You must give to every person a use value in excess of the cash value you receive so that each transaction makes for more life to all that you touch. The men and women who practice these instructions will certainly get rich; and the riches they receive will be in exact proportion to the definiteness of their vision, the fixity of their purpose, the steadiness of their faith and the depth of their gratitude. This concludes Wallace’s brilliant book. I sincerely thank you for watching these videos. I believed that Wallace’s wisdom when applied can benefit all of us. Knowing that you have the power to create your future is a key to a successful and prosperous life. Please take this information to heart and use it.